Monarch Air Group provides private air charter in Tel Aviv, Israel. Our clients benefit from top-notch service, unrelenting dedication to safety, wide selection of aircraft, and years of experience in chartering private jets. To obtain a free quote, please use our online quoting tool provided below, or call toll free 1-877-281-3051. Located on the Mediterranean coastline, Tel Aviv is the second largest city in Israel with a population of around 426,138 people. The modern, vibrant and dynamic city boasts the Unesco-listed Bauhaus-era buildings, breathtaking coastline, top-flight hotels, bars, nightclubs, and world-class restaurants. Tel Aviv is known as a ‘party capital’ and ‘the city that never sleeps’, and draws tourists, especially party junkies, from all over the world. With a large LGBT community, Tel Aviv is one of the best destinations for LGBT tourists. The city attracts more than a million international visitors every year. 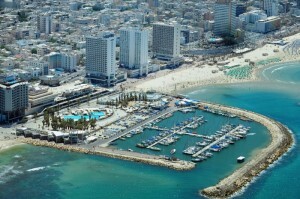 Tel Aviv is served by Ben Gurion Airport that is situated 15 kilometers southeast of Tel Aviv and serves both domestic flights and international flights, and Sde Dov airport that serves mainly domestic flights. Our operators are standing by 24/7 to assist you in scheduling your next luxury air charter to Tel Aviv, Israel. Call us today for a free quote.